Submitted by Jeff Buster on Sat, 12/06/2008 - 22:50. 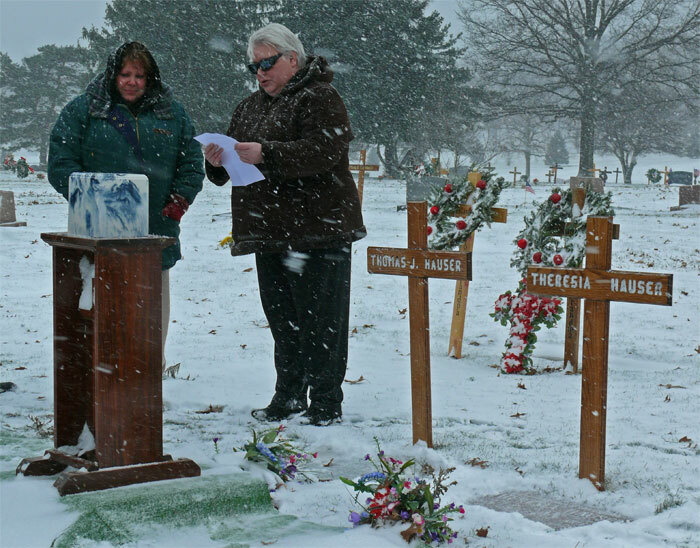 Ed Hauser chose this plot (for his mom and his brother Tom) in the All Saints Cemetery, Northfield, Ohio. This afternoon at 2:00 in a cold wind blown December snow, Ed joined them. Ed's sisters Sylvia (reading) and Caroline made me think...in hard to navigate emotional times, it's the women who pull us through. Submitted by lmcshane on Sun, 12/07/2008 - 08:14. CLEVELAND BROWNS FANS COME MARCHING IN; VIDEO OF DEMONSTRATION OUTSIDE THE FIRST ENERGY STADIUM!